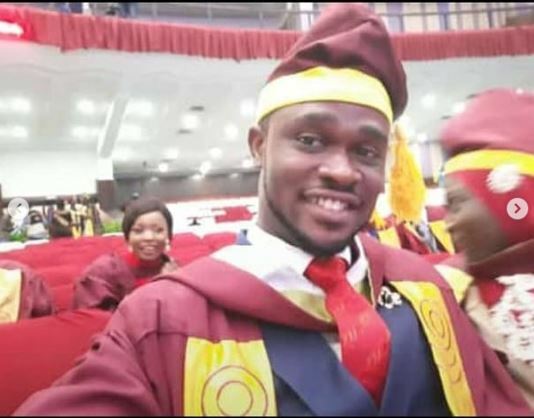 Oluwaseyi Adeyeye, a young Nigerian man, has emerged as the best graduating student of UNILAG some three years after he wrote it down as his goal. 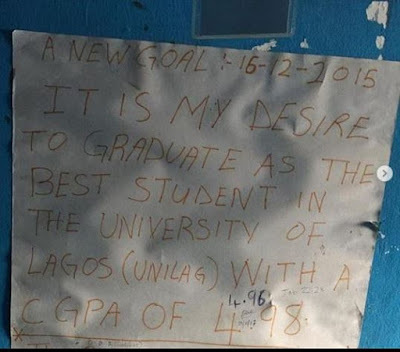 He wrote down his goal on the 16th of December, 2015. He desired to become the best graduating student. "Becoming the best graduating story was not without enormous challenges, but the journey started with a very strong determination and belief to achieve this feat. "This goal was written years back, and to the glory of God became a reality yesterday (3/04/2019). Knowing fully well that i never got any accolades during my primary and secondary education, i was inspired to put in great efforts and trust God in the process. "Today, I am happy i have achieved one of my written goals. I look forward to being celebrated again shortly. "I am grateful to God Almighty and I appreciate My parents (Mr & Mrs Adeyeye), Family members, Lecturers, friends, Course mates and other notable people like Vice President Osinbajo, whose visitation to my Family house left a great Impact. Also, my uncle has been awesome. I appreciate you Major General Olabanji. Finally, Thank you University of Lagos."